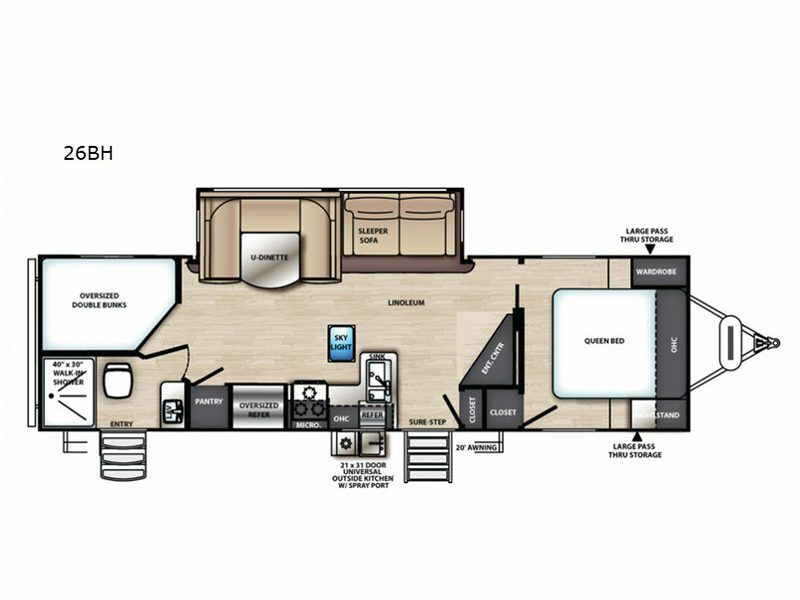 Get ready for a camping experience like you've never had before in this travel trailer. This unit can sleep up to ten people, so invite the grandparents and the cousins for an extra good time! The kids will love the oversized double bunks to crawl into each night after a long day. Gather around the U-shaped dinette for a family dinner like you enjoy at home. This unit features a slide out so you won't have to worry about being cramped when you're inside on a rainy day. The front private bedroom with a queen bed is a perfect escape to retreat to each night. Getting in and out of the bathroom is super convenient with it's own door leading outside. For a great time outdoors, cook dinner for the whole family using the outside kitchen and relax under the 20' awning!